Most financial services professionals acknowledge that success is not a solo effort. Learning from more experienced colleagues plays a part and is especially important in an industry such as wealth management where the landscape is continually changing. The value of mentoring may be undeniable, but it is less clear what it takes to be a good mentor and how mentees can get the most out of their mentors. The workplace is rife with opportunities for younger colleagues to observe and learn from their elders, leading many professionals to fulfil the role of a mentor without even realizing it. Virgil joined Commonwealth Bank in 1997 as a special credit officer and gradually rose through the ranks to his current position. He says the bank has a very young staff and working so closely with them over the years has given him many opportunities to listen, advise and guide. When he is not managing his team at the bank, Virgil is an active minister with the Church of God of Prophecy—another position that allows him to connect with young people. Both roles, he says, are about relationships. Cartwright began her career more than 20 years ago at Callenders & Co as a commercial litigator, but in 1999 left law to become a compliance manager with Barclays Bank. 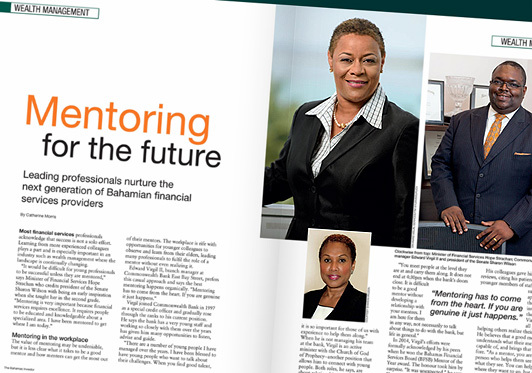 After several years in compliance, during which time she became the founding vice-president of the Bahamas Association of Compliance Officers, she returned to Callenders to specialize in commercial transactions. While practising as a litigator Cartwright also acted as a pupil master for several attorneys at the start of their legal careers. “When the students come up to you and thank you, that’s when you realize that it has made an impact and how personal it is for them,” she says.